When attending large events as a professional, things can get pretty hectic. Emails are coming in from all over the place inviting you to meetings while your calendar is packed with conferences and interviews. Some of us have so much going on that micromanaging the little details on who’s who and what’s happening where can turn out to be quite the headache. That’s where Bizzabo comes in. Bizzabo is an Israel-based startup founded by Eran Ben-Shushan, Alon Alroy and Boaz Katz, all alumni of the Sam Zell Entrepreneurship Program. It is currently funded by private investors while being advised by professionals in the business events industry. Bizzabo, which launched its private beta on September 12th in TechCrunch Disrupt’s Startup Alley, is a “a free location based mobile app for networking at business events.” It’s different from services like foursquare in that it goes beyond simply checking into an event or area; Bizzabo lets you know exactly who the professional attendees are and allows you to get in touch with them. Bizzabo helps professionals discover new business opportunities at meet-ups and conferences and enables event organizers to engage more effectively with their attendees. 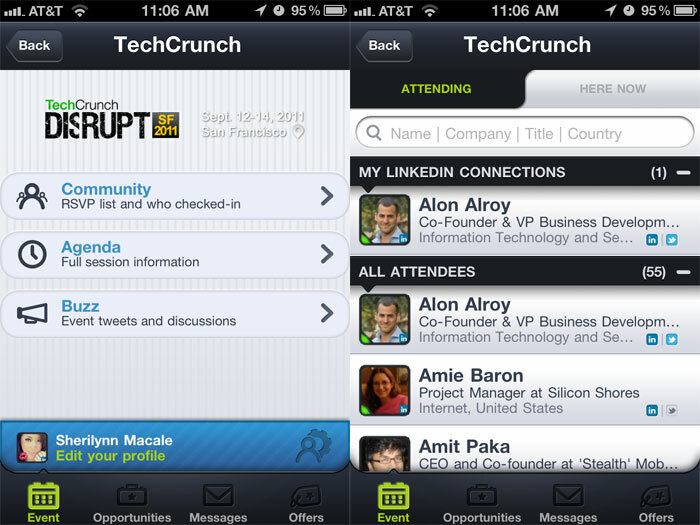 While attending Disrupt, I downloaded the Bizzabo app onto my iPhone 4 and took it for a test run. The first thing that pops up is a suggested list of current events near your location. New users to Bizzabo might be a bit confused with what to do here as the app lacks a simple “tutorial” mode or helpful “how-to” in order to get you started, but with a bit of tinkering and playing around, it’s easy to figure out. By tapping the event you hope to check into, it brings up a branded page containing the event’s community, agenda/schedule, and “buzz” (event tweets and discussions). To check into an event, you tap through to access its community category, hit the blue “RSVP” button at the top right of your dashboard, and set up an account by logging in through your LinkedIn profile. After getting past the initial setup phase, you’re good to go. Your profile is already filled out with your current title and company (obviously, keeping your LinkedIn profile current and up-to-date is important when using Bizzabo), and you are presented with a list of event attendees who are also checked into the service via Bizzabo. From here, you can browse through in-depth profiles on events attendees to discover more about each one and what they do, then mark who you’d like to meet with as possible “opportunities” — sort of like a check-list or “to do” on who you’re most interested in meeting. Another of Bizzabo’s main features is “Offers”. Through offers, exhibitors, sponsors and event attendees alike can create their own event-based and limited-time-only offers to encourage peer-to-peer interaction with those who might be most interested in meeting up. I created one of my own to test it out during Disrupt. In my offer, I proposed squeezing in a last minute meeting with me for startups or entrepreneurs to pitch their stories before I took off from the event. I was able to title my offer, include a short description, provide a link to whatever website I chose (in this case, I listed The Next Web, as it was most relevant to the offer), and limit the offer to as many attendees as I chose (I selected limiting the offer to 10 people so as not to overwhelm myself). I was also able to type in a response that would be sent along whenever someone accepted the offer. My offer went live immediately and appeared to event attendees. When Bizzabo users click on my offer, they are able to view everything I’ve written as well as tap through to check out my Bizzabo profile to get a better grasp on who I am and why I’m important. Here’s what my profile looks like. I’ve already taken the time to fill out my profile a bit. 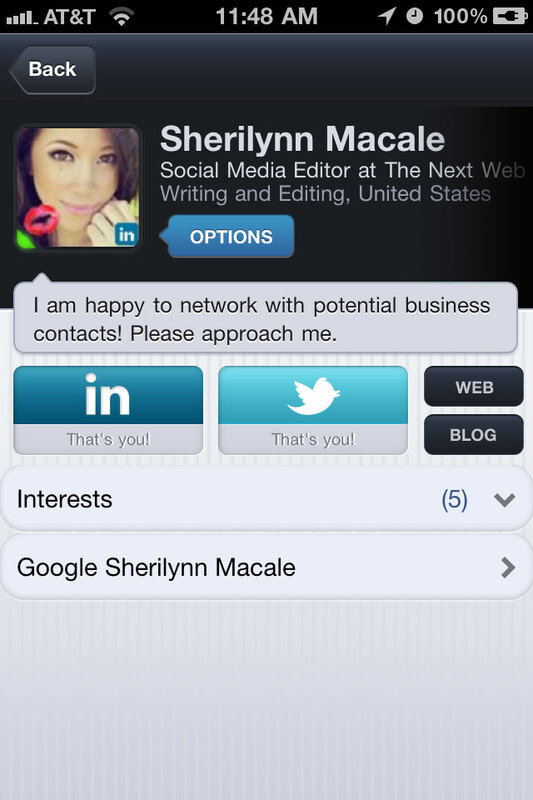 Besides the LinkedIn profile information that gets included automatically (my professional title, company, and location), I was also able to fill out a short bio, mark 5 of my basic interests, include links to my website and blog, and provide my Twitter handle, should Bizzabo users want to follow me. From my profile, Bizzabo users can mark me as an opportunity or person of interest, send me a private message, or even Google me to get a better grasp on who I am online. As for the the offer I put up earlier? It definitely worked. 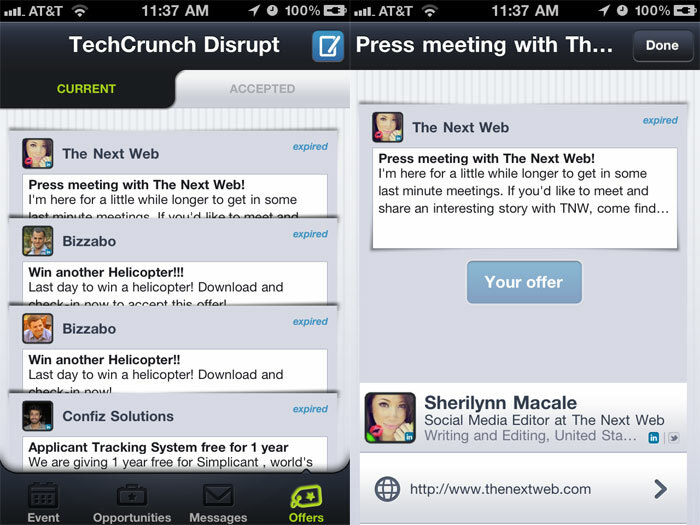 I was already busy taking several meetings during Disrupt, but during them, push notifications were buzzing on my cell alerting me to professionals attending Disrupt who were eager to accept my offer to meet with The Next Web. At this point, I took the time to check out the messaging system on Bizzabo, which was surprisingly speedy (even without Wifi connection) and is exactly up to the quality I’d expect from a well-developed iPhone app. Ben-Shushan noted that regardless of whether I lost connection or not, Bizzabo caches data constantly to bookmark our actions in the app without having to worry about lost content or information. Ben-Shushan also hinted at a new feature launching in the next two weeks that will be a game changer for event organizers themselves. 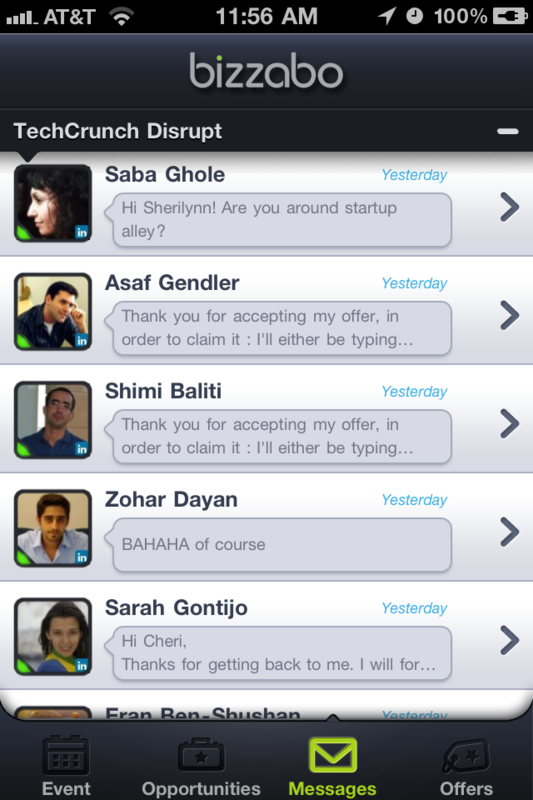 Of the many social networking tools and services I was able to test out during Disrupt, Bizzabo was definitely my favorite. Currently, it’s a service that isn’t diluted with giggling teenagers making fart jokes or “trolling” the event buzz-feed with silly remarks. Because the app is geared towards professionals, I can always expect to meet quality people through the service and keep better track of who I want to talk to, where I want to be, and what peer-offers or event-based deals are happening that I might be interested in. As for improvements, Bizzabo could definitely benefit from a basic start up tutorial, as well as the option to check into an event directly from the bottom-menu dashboard, or from the landing page of the event itself (rather than having to navigate through to the community category just to RSVP). Also, messages could stand to use some sort of “mark all as read” option, or even a way to temporarily mute our messages. For myself, I received so many notifications accepting my offer that I just didn’t have the time to respond to each individually — I was already swamped with meetings! Even better would be basic event descriptions, as I can see myself using this service as an event-discovery tool. As of now, events are simply titled and logo-branded with no description for what exactly it is. Consumers like me might use Bizzabo to check out other events relevant to our interests, and it would be helpful to know what these random listings actually are. Overall, I’m definitely impressed with the application and am look forward to seeing where the founders will take it. Bizzabo has already hinted at aggregating check-ins with Foursquare and PlanCast, etc, so it can only go up from here. If you’re interested in checking out Bizzabo, it’s available now in the App store for free and will be available for Android as well in a few days.